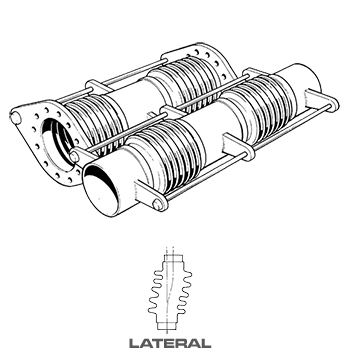 RADCOFLEX metal expansion joints consist of a metal bellows element fitted usually with fixed or floating (swivel) flanges, or pipe weld ends to facilitate installation into a pipework system. 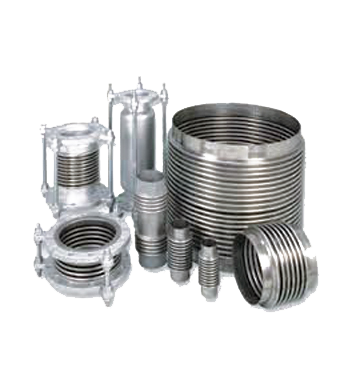 The metal bellows element consists of a number of convolutions formed into the wall of a relatively thin gauge cylinder usually of stainless steel or other high nickel alloys. 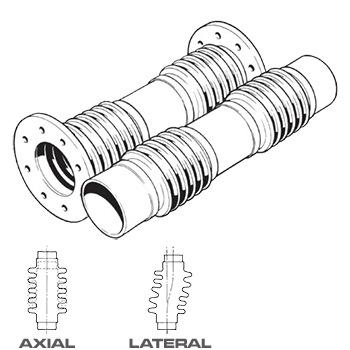 RADCOFLEX metal expansion joints can be manufactured in circular, square or rectangular shapes in accordance with the Standards of the Expansion Joint Manufacturers Association Inc (EJMA). The following are the common supply but other special application products can be supplied. A single metal bellows element fitted with fixed flanges, floating flange or pipe weld ends for use in absorbing movements in pipelines. The joint has no movement restraining hardware attached. Internal flow liners can be fitted to assist with obtaining a smooth flow and to minimise friction losses. Where vibration absorption is a consideration, the bellows element can be constructed from more than a single ply of material i.e multi-ply. The amount of movement is dependent upon the number of convolutions in the bellows element. Movements stated are for non-concurrent movement (i.e. each type of movement occuring independently). Consult RADCOFLEX if movements are to occur concurrently as movement capabilities will be impacted. 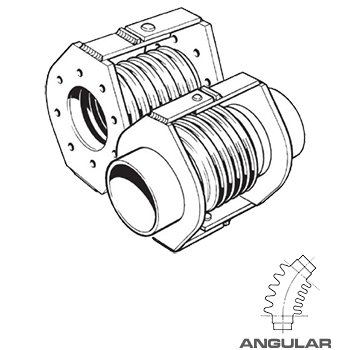 A single metal bellows element fitted with flanges or pipe weld ends, with hinge plates and pins to contain pressure thrust forces on a piping system in a single plane only. Suitable for angular movement in a sinlge plane only controlled by the hinge. 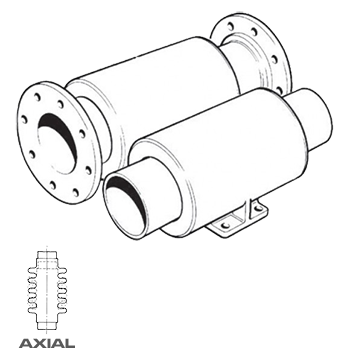 A single metal bellows element fitted with flanges or pipe weld ends, with external gimbal ring and offset hinge plates and pins to contain complex multi-plane movements in a piping system. Suitable for angular movement in all planes controlled by the hinges on the gimbal rings. 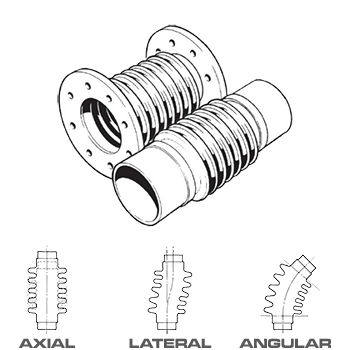 A single metal bellows element fitted with flanges or pipe weld ends and incorporating a pipe liner and an external shell. This style of joint is most suitable for applications involving movements in long piping runs with large amounts of thermal expansion. Also recommended where maximum system safety is an issue, and protection of the bellows element is essential. The joint is externally pressurised. With an internally pressurised bellows the movement capability is restricted by the squirm pressure. When the bellows is pressurised externally it becomes pressure stabilised irrespective of the length to diameter ratio thus allowing the use of a greater bellows length at a given pressure. Suitable for large axial movements. Standard joints have 100, 150 & 200mm of movement. 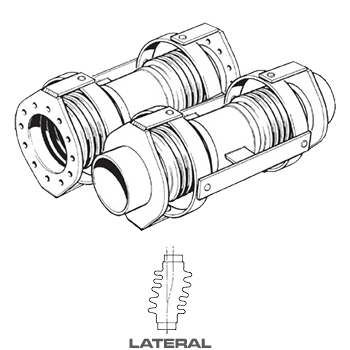 A single metal bellows element fitted with flanges, floating flanges or pipe weld ends, with movement control tie rods attached to the joint hardware. The joint is generally fitted with welded (fixed in place) tie rod washers as movement restraining stops, or alternativly can be with threaded rod as the tie rod utilising adjustable nuts as the movement restraining stops. This latter method is generally referred to as jacking rods (i.e. JFF Joints). This joint is used to absorb small amounts of lateral deflection and/or piping misalignment thus relieving stresses on attached pipework or equipment and can also be used as a vibration eliminator provided the vibration is in the lateral plane not the axial plane. Suitable for small lateral (offset) movements controlled by the tie rods. Two metal bellows elements connected by a centre spool and fitted with flanges or pipe weld ends, with movement control tie rods attached to the joint hardware. The joint is generally fitted with welded (fixed in place) tie rod washers as movement restraining stops, or alternativly can be with threaded rod as the tie rod utilising adjustable nuts as the movement restraining stops. This latter method is generally referred to as jacking rods (i.e. JUFF Joints). Suitable for applications where large amounts of lateral movement must be absorbed without imposing pressure thrust forces on the piping system. Tie rod support lugs attached to the centre spool are provided to assist in stabilising the centre spool. 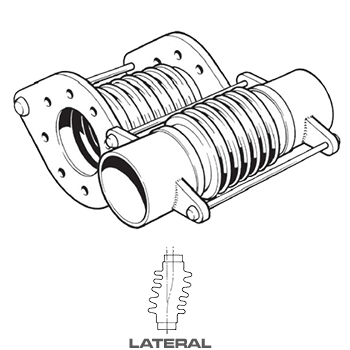 Two metal bellows elements connected by a pipe centre spool fitted with flanges or pipe weld ends, with hinge plates and pins to contain pressure thrust forces on a piping system. This joint is virtually two single HFF joints connected by a factory fitted pipe piece thereby reducing the system weight by involving two flanges instead of four, and assisting in installation by not having to provide the spool piece on site. Suitable for large lateral offset movements in a single plane only with minimal reaction forces. 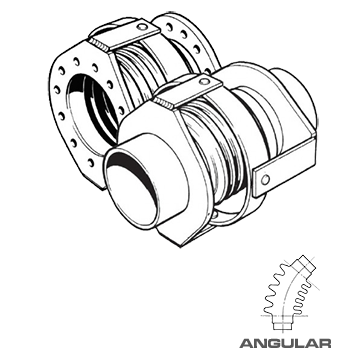 Two metal bellows elements connected by a pipe centre spool fitted with flanges or pipe weld ends, with external gimbal rings and offset hinge plates and pins, to contain complex multi-plane movements in a piping system. 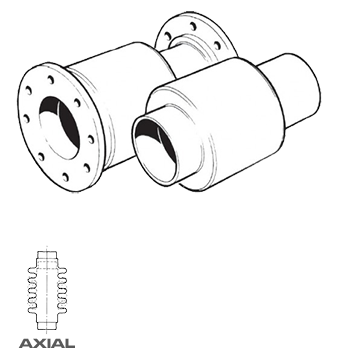 These joints are virtually two single GFF joints connected by a factory fitted pipe piece thereby reducing the system weight by involving two flanges instead of four, and assisting in installation by not having to provide the spool piece on site. Suitable for large lateral offset movements in any lateral plane with minimal reaction forces. 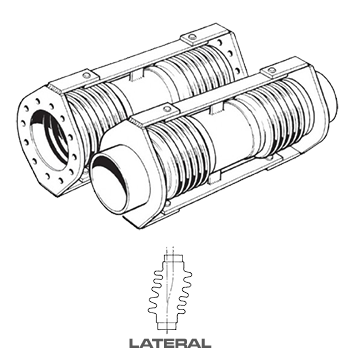 Two independent metal bellows elements fitted with pipe liners and a single external shell. This style of joint is most suitable for applications involving movements in long piping runs with large amounts of thermal expansion. Also recommended where maximum system safety is an issue, and protection of the bellows element is essential. A central intermediate anchor foot is attached to the joint as required. 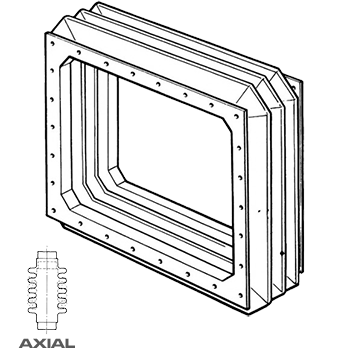 Drain ports can be provided in the shell for removing sediment or condensate. Suitable for large axial movements. Metal bellows element rails constructed into a square or rectangular shape utilising single or double mitre corner welding, and fitted with flanges or flat bar weld ends. The joint can be fitted with internal liners, external covers and movement control hardware. This type of joint is used primarily to absorb thermal expansion in low pressure, high temperature air and gas ducting.